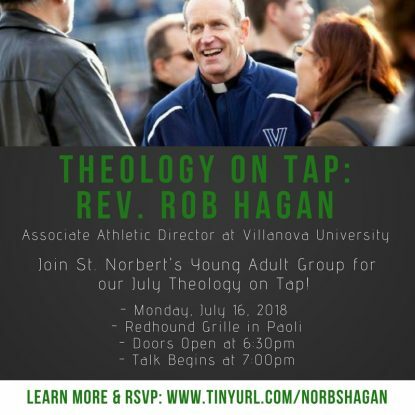 Augustinian priest Father Rob Hagan will lead a July 16 “Theology on Tap” session for the St. Norbert Parish young adult group on July 16 from 6:30 p.m. to 9 p.m. at the Redhound Grille in Paoli. Father Hagan, who is Villanova University’s associate athletic director, entered the Order of Saint Augustine in 1997. He served as chaplain at Thomas Jefferson University Hospital in Philadelphia and at the University of Maryland, College Park, and received a Masters in Theology from the Washington Theological Union in 2003. He is a past member of the Pennsylvania Bar Association, the Delaware County Bar Association and the Delaware County Association of Criminal Defense Attorneys. Father Rob also serves as the chaplain for the Villanova men’s basketball and football teams. For more information, visit https://www.facebook.com/events/1923976774567812/.